In our book “Powerhouse” we identified Process – by which we mean the mechanical model for how an institution is run – as one of the 4 pillars of our Powerhouse Model critical to sustained institutional high performance. The specifics of process transformation are completely situational, with needs and solutions varying by institution across sectors, geographies, sizes and time, however in this article – the first in a series of three – we want to identify the broad “problem” with process that, in looking to transform performance, leaders need to address. Strategic processes relate to the sharing of relevant information, the framing of choices and/or the taking of decisions. The scope of strategic processes is broad, ranging from strategy development and deployment at one end of the spectrum to engagement and communications at the other. By and large strategic processes are “good” and, while the generic challenge is to optimize them to be as efficient and effective as possible, many high-performance organizations – Toyota, and Southwest Airlines being just two examples – deliberately overinvest in aspects of strategic process with a view to ensuring their teams are informed, aligned, focused and motivated to deliver at their best. Regulating processes relate to checking that things are happening as they should. Every institution in every situation has an amount of regulating process that they are obliged to implement – to meet their own requirements or those, for example, associated with legislation or regulatory bodies . Like strategic processes, we believe that regulating processes are “good”, however unlike strategic processes, we suggest that institutions should target at all times to have the minimum amount possible. The problem with regulating processes is that the amount required is a function of the extent to which the institutional environment is under control – that is to say that the less the environment is under control, the more process is needed for leaders simply to keep track of what’s going on . The consequence of this is that the extent to which an institution’s performance is in control today has a disproportionate influence on its capacity to deliver better performance tomorrow, as time invested in monitoring and keeping up by leadership teams of institutions that are not under control comes at the expense of time invested in considering improvement. Accommodating processes are those that cater – explicitly or implicitly – for individual or collective dysfunctions within institutions. Examples of accommodating processes include meetings to get individual leaders up-to-speed with status information because the reporting systems for making performance visible are absent. Or decision-processes that happen in parallel across multiple functions because neither the appetite nor the mechanisms for cross-functional engagement are in place. Or meetings to take decisions that have been escalated but that should really have been taken at a lower level. Or regulating processes consistent with an out-of-control environment that are imposed on an environment that is under control. Unlike the other two forms, accommodating processes are definitively “bad”, and their existence should provoke strong allergic reactions in leaders everywhere. Unfortunately, however, in institutions other than those that are the best in their games, this tends not to be the case, and in some instances we have observed, we would suggest that accommodating processes account for 30% or more of the total. Top business leaders, academics and strategists, including Andy Grove of Intel and Michael Mankins at Bain & Co., have argued that an institution’s true scarce resource is its leaders’ time. The reality of life in most of the institutions that we come across – and particularly the big, multinational ones – is that most leadership time is spent engaging in process activities of one form or another, with most of the individual leaders we meet feeling increasingly pressured to fit all of their process obligations inside the boundaries of a working day or week. We see many more examples of calendars that are double, or triple-booked than we see of calendars with “white spaces” for thinking or doing work. As Mankins and others have observed, and our own work would confirm, when this reality unfolds, the norm is for regulating and accommodating processes to be squeezed in, while strategic governance gets squeezed out. 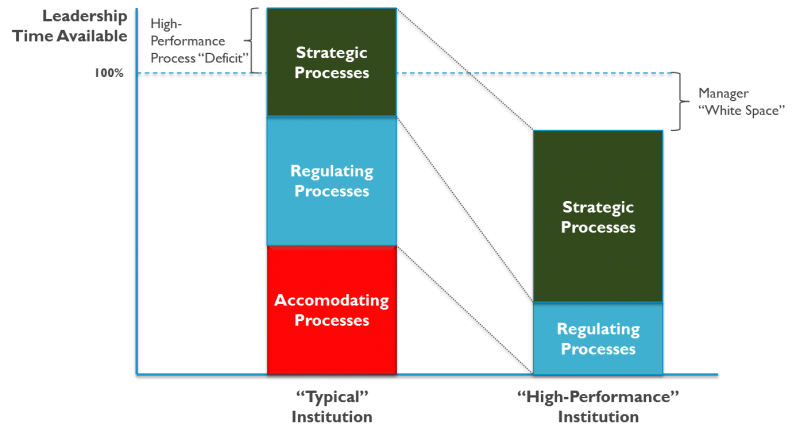 Simply put, the gold standard profile for high performance governance is dominated by strategic processes, supported by the minimum possible amount of regulating processes, with zero presence of accommodatingprocesses. Secondly the “volume” of process, or the amount of time it takes up in total, should fit comfortably into the working days/weeks/months of the institutions’ leaders, with “white space” to spare to allow for thinking, lunch, and other currently unimaginable pursuits. Fig. 1 below captures an idealized process transformation.While this captures the ideal profile of high-performance process, we can push harder to define its broader characteristics. It’s strategic – it’s designed (in the round) to explicitly and directly support the ongoing evolution and deployment of the institution’s Vision. It’s consistent across the institution – built on common, standardized principles, frameworks and information-bases, agreed and bought-into by all. It’s integrated, joined-up and seamless – information/data cascades up, down and across the organization in sync. It’s about leading and managing in parallel - driving better decisions, more decisions, and more timely decisions, system-wide – ensuring decisions are taken once, by the right people, working as “close to the action” as possible. Decision-rights are clear and respected, as are escalation processes, however these are used by exception only. It drives better conversion of decisions into action into performance, through increased accountability and (better and faster) visibility of actions and performance. It’s educational – creating better understanding of operations and increased awareness of cause and effect – within and across functions, up and down the organization. It is energizing, engaging and inclusive – it supports and builds collaboration, team-working and trust – both within and across functions. It is “anti-silo”. It’s living, dynamic and situational– it evolves over time. There’s (always) just enough of it – it frees up, trusts and expects – leaders to lead, and people to actually do what they need to get done. Process models that are holistic and satisfy these “acid tests” can truly be described as high-performing and contributing to the competitive advantage of their institutions. In the first instance leaders need to understand that leadership and management processes take place in a much broader organizational context, as such, as process “architects”, we have to make use of the full organizational design toolkit to help us make progress. Organizational structure – The roles and responsibilities of participants and groups as leaders of the institution, its functions and its operations. In the round with regard to the entirety of the model and specifically with regard to, for example, information provision or decision-making for individual elements. People – The capabilities and experience of those taking part, as well as their attitudes, motivations, and other behavioural standards (e.g. for attendance, preparation, participation, follow-through) as participants in the model. Information – The nature, timeliness and presentation of information to support the processes taking place. Physical (and virtual) environment– The nature and setup of the locations where processes take place – from buildings and physical infrastructure, to individual settings and layouts, to technology setups and configurations. The alignment of where we work with who we are, and how we work. Broadening out the toolkit in this way on the one hand creates lots of design options, but on the other adds complexity to the job. In practice high performance leaders recognize that process design is complex and takes time, resources and real commitment. It also takes an understanding of cause-and-effect across the areas listed above - progress in any of which has the capacity to deliver multiplier benefits, while absence of consideration/progress can cause the functioning and effectiveness of the whole institution to collapse. Startup institutions have the luxury of creating process models from a blank canvas. Leaders of startups can implement comprehensive process blueprints and then “fill them up” with people and work. (Note we saw institutions like Tata use this approach to deliver real impact in new subsidiaries and ventures). Existing institutions don’t have this luxury. Rather they have process models in place that – for better and for worse, through a combination of accident and design – enable their operation and performance over time. 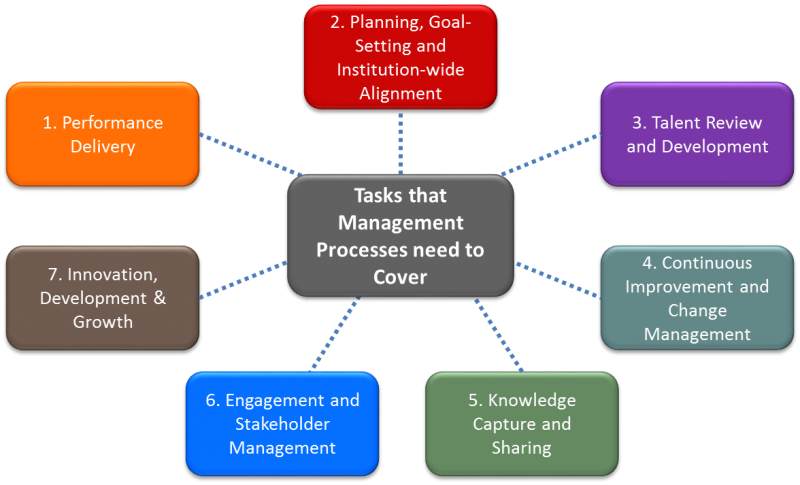 As a result process transformation in existing institutions, by necessity, needs to provide absolutely clear direction, to be explicit about those aspects of existing models that are to be maintained and leveraged and, in particular, to be explicit about identifying and addressing those aspects of existing models to be eliminated or transformed. In our client work we have often come across situations where new processes have simply been layered on top of old, with the effect that competing messages became widespread and an already chronic “squeeze” on the requirements and calendars of leaders became even worse. The first step in high performance process transformation is to understand the institution, and more particularly its vision and strategy, as the delivery and evolution of this Vision and strategy represents “true north” towards which efforts must be oriented. From this, senior leaders should create a “design brief” – in essence a short document that articulates the scope of the exercise, a high-level description of “how we want this place to work” in the context of its Vision and Strategy, and the key measures and targets (quantitative and qualitative), that link to this and bring the brief to life. Fig. 1 shows an illustrative process scope for a business institution. Facilitating cross-leadership team discussion of the brief is, in itself, a valuable step in this process, as it builds understanding, alignment and commitment while also allowing “quick wins” to be identified and pursued. In our experience, however, it is rare for briefs of this type to be created. As a result, we have found that many process transformations “start in the middle”, with limited, narrow perspectives on scope and on what they are trying to achieve. Having agreed the brief, the overall process model should be broken down, under each of the areas of scope, into that which happens (or needs to happen) daily (and in some instances, hourly), weekly, monthly, quarterly and annually. From there, leaders should look to establish a small number of core cross-functional and/or functional “anchor processes” around which we can design the model, working piece by individual piece. In the same way as process design is hard, so also is process transformation. It requires conviction, commitment, expertise, resources and (some) patience, as well as a disciplined focus on weeding out unhelpful/obsolete processes wherever they are found. Setting an explicit, stretch goal at the outset is helpful in this regard as a means of focusing attention and effort. For example one institution we studied adopted the standard of eliminating 2 hours of management process activity for every one hour that they added. Actually, practically achieving a transformation of this magnitude requires leaders – who by the way are typically trying to do a “day-job” at the same time – to be provided on an extended basis with relevant, fit for purpose support and coaching.